AFM is capable of mapping different electric properties of materials to topography images. These data can be used for analysis of the structure and composition of heterogeneous samples, as well as for quantitative characterization of individual grains or defects on surface. Fig. 1. Images are courtesy of Sergei V. Kalinin, Marcus Freitag, AT. Johnson, Dawn A. Bonnell, University of Pennsylvania. Electric properties of a sample can be mapped using probes with conducting coatings, when AC or DC bias is applied between the tip and the sample. Contact mode or lift mode can be used for this purpose. 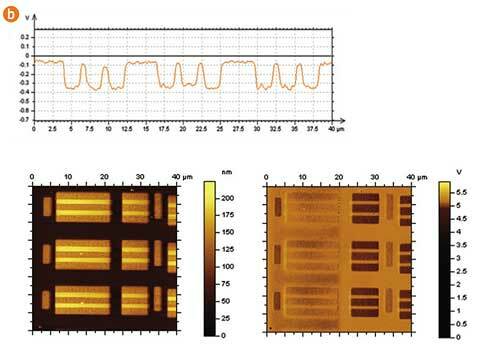 A number of specific AFM experiments such as studies of piezoresponse (Piezoresponse Force Microscopy), capacitance (Scanning Capacitance Microscopy) and measurements of DC/AC current (conducting AFM, tunneling AFM, current-sensing AFM, etc) are performed in contact mode AFM. Contact electric techniques generally require the absence of a gap between the tip and the sample and sufficient area for ohmic or capacitive contact, which is related to higher tip-sample forces and cantilever spring constants (up to 50 N/m) than in regular contact mode. Relatively soft (0.03 - 0.3 N/m) conducting cantilevers are optimal for high lateral resolution while cantilevers with a higher spring constant are better for quantitative measurements. 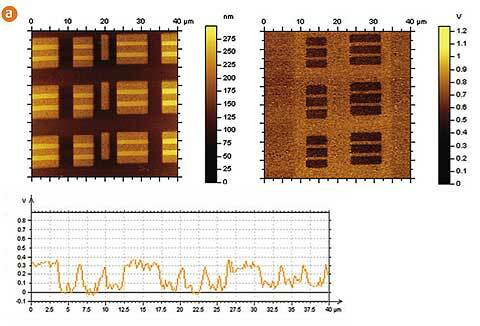 The measured currents can lie in the range of 100 fA for Tunneling AFM to 1A for SSRM. However, it is generally not recommended to exceed the 200 nA current limit for coated probe tips. The conductive diamond coating of the DMD series ensures the highest tip lifetime in this demanding application. The Pt coating offers acceptable resistance to wear and electromigration firmness. Tip radii of Pt coated probes vary from < 40 nm for the low-noise DPE series down to < 20 for the high-resoltuon DPER series. The investigation of electric properties is performed in single-pass or two-pass (lift-mode) techniques. Traditionally, the probes of stiffness ~ 5 N/m with conducting coatings are used for lift-mode measurements. In some cases, doping of the Si wafer, which was used for microfabrication of the probes, is sufficient to provide reasonable force response to electrostatic interactions with a sample. Lift mode measures topography during the first pass and another electric or magnetic property of the sample during the second pass. This minimizes the interference between the two kinds of data. The spring constant and resonance frequency of the cantilever should be chosen to provide stability in tapping mode and high sensitivity to weaker forces on the second pass. In most cases the HQ:NSC18/Pt probes are a good place to start. The Pt coating offers a tip radius of < 30 nm and good wear-highest resistance. Among the serious limitations of Electrical Force Microscopy are the sensitivity and signal to noise ratio. Enlargement of the probe tip radius can increase the area of electrical interaction and improve these parameters, but this improvement leads to a loss of resolution in both topography and EFM imaging. The novel DPE probe consists of a special structure of conductive layers, which provides a more stable electrical signal and less noise with little impact on resolution. Fig. 2. compares the topography and EFM scans of a semiconductor structure imaged by a standard NSC14/Ti-Pt probe (now upgraded to HQ:NSC14/Pt) and the new DPE probe (now upgraded to HQ:DPE-XSC11). The signal-to-noise ratio for the scans taken with the NSC14/Pt is about 3-4, while it is more than 10 for the scans using the DPE probe. Fig. 2a. Topography (left) and surface potential (right) images of a Static Random Access Memory(SRAM) structure obtained by single-path Kelvin Force Microscopy. A regular NSC14/Ti-Pt probe with a tip radius of ~25 nm was used.